The Countdown is over… TV Quiz champ wins 1st GUKPT of 2018! It’s a wrap for the first GUKPT of the year. Grosvenor Casinos’ 12th season of its popular poker tour kicked off with a belter of a leg set in The Poker Room’s iconic cardroom. It was a sell out across the week which saw poker action in both the tournament and cash game areas in full flow. The £200,000 Guaranteed GUKPT Main Event welcomed an incredible 433 entries, creating a staggering £433,000 in prize money. As always there can only be one winner and this time the Main Event crown fell into the deserving hands of 29-year-old professional player Andrew Hulme. 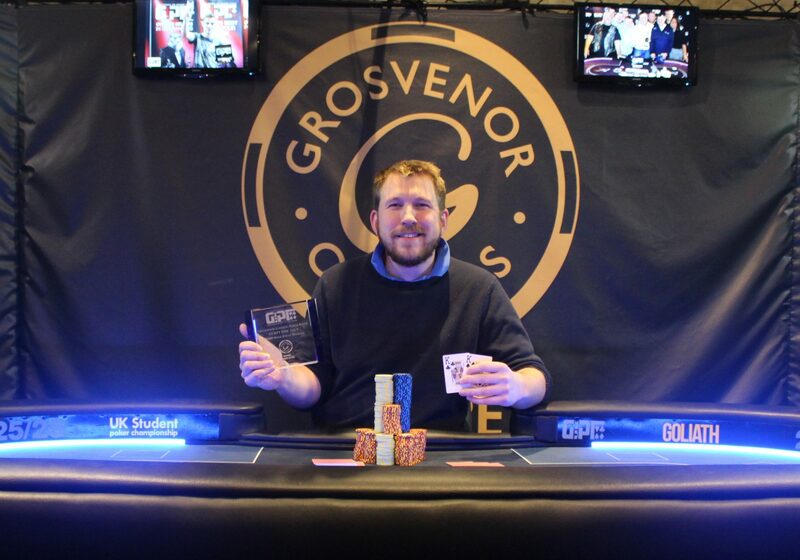 Andrew is no stranger to deep runs in major poker events but this is by far his greatest poker achievement after beating off some stiff competition and earning himself an incredible £112,000! Andrew, originally from Stamford, is not just a recognisable face on the poker felt. Countdown fans will know Andrew’s mathematical (and vocabulary!) prowess is not just limited to making money at poker, recognising him from his stint as Countdown ‘Octochamp’ in 2009. It was no easy feat for Andrew with a very strong lineup taking their seats for the final table on Sunday. However, holding the chip lead for much of the final day he held his nerve to the end, ultimately defeating Dean Swift after a hotly contested heads up battle. The £200,000 Guarantee and £1,110 buy-in inevitably makes the GUKPT one of the most prestigious events in the country and it regularly pulls in some of the biggest names in the game. Amongst the notable attendees for this event were writer, presenter and two time EPT champion Victoria Coren Mitchell, back at the venue which kick started her poker career. The GUKPT now heads North towards Grosvenor Casino Bury New Road in Manchester for the 2nd leg of the year. Similarly to London the leg features a £1,110 buy-in and £200,000 Guarantee and there are still plenty of opportunities to win your seat for as little as 25p online on Grosvenorpoker.com.